I began my previous book, Churchill and Sea Power, by explaining why I had chosen to publish a new work about Winston Churchill, surely one of the most studied historical figures of the twentieth century. Four years later, I find myself in the curious position of having written another volume about Churchill, and on a topic that I had already addressed in the earlier book. This new project was inspired by a sense of unfinished business. Churchill and Sea Power devoted around 25 pages to the opening months of the First World War and the Dardanelles campaign, which was hardly enough to do justice to such a rich and complex subject. In the limited space I had to work with, there was no room to delve into the details of the naval operations and explore precisely why things had gone so badly wrong. I could give only the basic outlines of the Britain’s chaotic decision-making process and Churchill’s role in it. And there was little scope to examine the complicated relationship between Churchill and his naval advisers, especially Jacky Fisher. All I could do was sketch out those aspects of the campaign relevant to the subject of the book I was writing -- Churchill’s development as a naval strategist over the course of half a century. 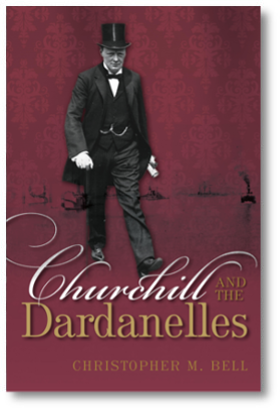 On a more personal level, I wanted to satisfy myself that I had at last worked out where the Dardanelles fit into Churchill’s legacy. I had absorbed Churchill’s case for the Dardanelles even before embarking on my undergraduate career. His memoirs of the First World War, The World Crisis, made a strong impression on me. Its claims seemed eminently plausible. And I have to admit that I wanted to believe that the figure whose heroic defiance of Nazi Germany I admired had, in fact, been right about this as well. Churchill’s case for the Dardanelles was validated by enough historians that it did not seem safe to dismiss it lightly. But it was also obvious that most of these historians were not authorities on the Royal Navy. And many of them were obviously predisposed to accept Churchill’s claims uncritically, making a degree of scepticism seem warranted. Yet even as my doubts about Churchill’s version of events grew, I still nurtured hopes that an exhaustive study of the evidence would one day reveal that he had been right to launch this campaign – that it actually was a brilliant concept that might have succeeded if not for the mistakes of lesser figures. This is not what happened though. As I delved deeper into the documents, I had to admit that Churchill had made mistakes. Many of them. Some of them quite serious. Churchill was not, after all, the hero of this particular story. Nor was he a victim. But it was also clear that his failures did not automatically make him the villain of the piece. He had not been wrong about everything. In fact, there was a great deal he got right. And he was by no means the only one to make mistakes. Many of the recurring criticisms that have been levelled against him over the years are distorted, exaggerated, or wrong. The goal, then, has been to get as close to the truth as possible. I realised early on that this study would not produce a simple thumbs-up/thumbs-down verdict about Churchill that would please either his admirers or his critics. The past, unfortunately, is seldom that simple. Sometimes we have to be satisfied with ‘it’s complicated’ for an answer.